The scenario for a revolution must be written in the manner of a film script -- JRA manifesto, 1995. 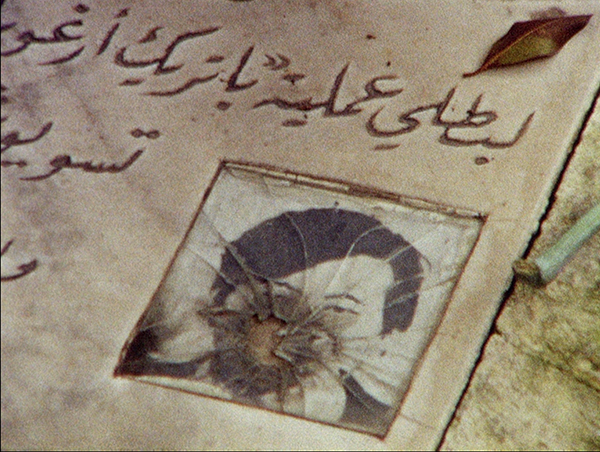 While in Japan researching extreme leftist groups gone underground, the French artist Eric Baudelaire struck a deal with Masao Adachi, the renegade director/screenwriter who had abandoned filmmaking in the 1970s to join the Japanese Red Army in Lebanon and fight in the Palestinian cause. In return for his story, Adachi asked Baudelaire to shoot scenes for him in Beirut based on his cinematic theory of landscape, fukeiron. In return for this super-8 footage, Baudelaire asked Adachi to write a script, a semi-autobiographical fiction, to be made after the completion of The Anabasis, Baudelaire’s dark and suspenseful documentary about the JRA. “Anabasis” is the name given, since Xenophon, to a soldier's journey into the unknown and the return home in a changed state. The new screenplay, about a group of former Palestinian militants haunted by their pasts, would be the protocol for constructing a film, The Ugly One, on memory, revolution, and cinema, seemingly written and rehearsed before our eyes. There will be a 10-minute intermission between the two films. Eric Baudelaire is a Paris-based filmmaker and visual artist whose research-based practice includes printmaking, photography and publications. These have been shown in installations alongside his films in solo exhibitions at the Fridericianum, Berkeley Art Museum, Bétonsalon, Bergen Kunsthall, Beirut Art Center, Gasworks, La Synagogue de Delme and The Hammer Museum. His recent feature films were selected for the FIDMarseille, Locarno, Toronto, New York and Rotterdam film festivals. He has also participated in the Sharjah Biennal, Seoul Mediacity Biennal, Yokohama Triennal, the Taipei Biennial, Berlin Documentary Forum 2, La Triennale in Paris, and the Baltic Triennial of International Art. His films and installations are in the collections of Reina Sofia Museum, MACBA, Centre Pompidou and The Whitney Museum of American Art. Image: The Anabasis of May and Fusako Shigenobu, Masao Adachi, and 27 Years Without Images, 2011.